These techniques and tips will show a beginner the range of ways to blend, shape, texture, and finish polymer clay for dollhouse miniatures and food. Try any of these ​beginner projects to practice a technique and add it to your repertoire for making miniatures. Now you know how to make miniatures! Instead of keeping vast quantities of seldom used colors, learn to blend your own whenever you need them for a project. These blends are based on using black, white, transparent, red, blue, yellow (or turquoise, (cyan), magenta, and yellow) in order to blend any color and make your own basic shades, tints, and hues. 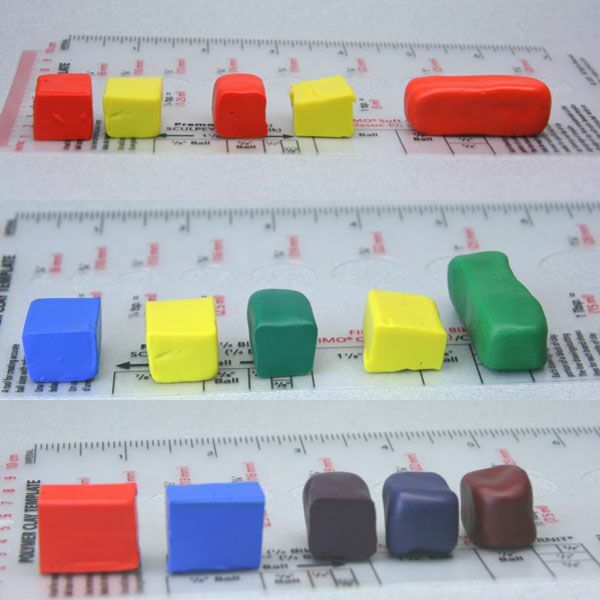 You can easily make your own shape cutters for polymer clay miniatures. These can be used to make decorations, clay blends, tiles, or small baked goods such as miniature cookies. The miniature cutters are all made from recycled heavy tinfoil (aluminum foil) plates with waste polymer clay handles. Start with simple shapes first, and work your way up to more complicated bends. Caning is a technique used to take a design smaller and smaller for miniatures. Canes are used for fruit and vegetable slices including oranges, lemon, grapefruit, strawberry, onion, peppers, tomatoes, eggs, and mushrooms. You begin with a design large enough to work in the details, then roll the polymer clay thinner and thinner with a regular motion to reduce the size of the design. Caning techniques work best with firm brands of polymer clay. Polymer clay can be pressed into and baked in simple molds made from two-part silicon mold putty to make a range of custom shapes. Many projects use simple molds as a base. For some polymer clay projects, you can make your own tools from beads, stamps, or other items you have on hand. Miniature baked goods often use texturing tools you can purchase or make yourself from clay, beads, or found items. The texture is added to bread, cakes, and other miniature food items before the clay is fully cured. You can make your own tools for texturing or use small items you have on hand like toothpicks or pins. There are tutorials that introduce a beginner to creating realistically textured finishes on polymer clay. Outer finishes on miniature baked goods aren't made using polymer clay, but are most often achieved with artist's pastels or colored chalks. These details add a realistic finish to your miniatures. Sometimes particular techniques are needed to make items small enough to be realistic in miniature. Very thin layers or rolls of polymer clay are used to make doll food like pasta or even hot dogs. You can also make hamburgers, cold cuts, and more. Simple box-making techniques can be used for a range of miniatures, from food to containers. These projects use similar techniques that can be adapted for all kinds of miniature projects.